In 1937, Yilmaz Akhundzade was sent off to an orphanage. He was only one year old. His father the poet Ahmad Javad had been arrested and shot, and when his mother would not denounce and divorce him as an "Enemy of the People", she was sent into exile for 8.5 years. She left four children behind. Yilmaz was born on January 5, 1936, in the village of Seyfali in the Shamkir region of Azerbaijan. In 1955, he graduated from Leninkand (Lenin village) Secondary School and went on to study at the Law Faculty of Azerbaijan State University from which he graduated in 1961. From then onward until his retirement in 2002, he worked in various responsible positions as a lawyer and later as one of Azerbaijan's Supreme Court Judges. We interviewed Yilmaz Akhundzade in November 2005. Unfortunately, he rather unexpectedly passed away after complications from surgery in February this year. We're so sorry that he did not even have the chance to read the interview that we publish here in tribute to his own remarkable accomplishments, especially given the tragic circumstances that marked his early childhood. My father, the poet Ahmad Javad (1892-1937) always fought for the independence of Azerbaijan. He was always at the forefront of this struggle. During World War I, he volunteered in the army and was assigned to fight at the Bulgarian front with the Turks against Armenians. Then he returned to Azerbaijan. He was a member of the first Parliament of Azerbaijan Democratic Republic and served as its Secretary. In 1923, Ahmad Javad was arrested along with others who had fought for the independence of Azerbaijan. Later, he was released. Though my father today is remembered mostly for writing the lyrics to Azerbaijan's National Hymn which have been been readopted since our independence, he also wrote the words to the Turkish National March "Chirpinirdi Gara Daniz" (The Black Sea Struggles). This song is as strong as a national anthem. Every Turk - from the simple workers to the president - knows it. Ahmad Javad was primarily criticized for two poems: "Kur" and "Goygol". The Kur is a river that originates in Georgia and flows down through the middle of Azerbaijan to the Caspian. Goygol is a beautiful scenic glacial lake in the foothills of the Caucasus Mountains in western Azerbaijan. Do you have a message for the blowing winds? No matter, where they come from, Goygol! Critics said Ahmad Javad was sending his greetings to the Musavat Party in Turkey when he wrote "the winds blowing over Goygol". It was this poem, published in 1925, which landed him in so much trouble. It was severely criticized and my father was accused of being a "Nationalist" and "Pan-Turkist". The consequences were devastating. In all, my father was arrested, not once, but three times (1923, 1925, and finally in 1937). It's impossible to imagine how such experiences affect a person psychologically. Agents suddenly barge into your house unexpectedly, confiscate everything you have, and drive you out. I don't even have a single momento or keepsake that ever belonged to my father. I have not even one little item by which to remember him. They confiscated everything in our home three times so there was nothing left that had belonged to us. In those times, keep in mind that poets were not well off. They worked for the nation, not for themselves. Most of the families who were repressed know the names of those who turned in their parents. I'm not aware that my father was betrayed by any one specific person. He was criticized a lot in general. There were many critics who complained about other poets and other writers. For example, Mustafa Guliyev wrote many critical articles about various poets such as Ahmad Javad, Mikayil Mushfig and Seyid Husein. Even Samad Vurghun wrote a poem against my father: "I'm not Sabir; no, I'm not Javad, I'm their enemy; I'm a stranger to them." "The repressions - the arrests, executions, imprisonments and exiles-not only had a devastating impact upon the immediate families, but they had a profound effect upon Azerbaijan as a nation. Wiping out the activists, the brightest thinkers and the most perceptive minds of the nation is the equivalent of destroying the entire nation." Samad Vurghun used to criticize father's poem Goygol. Later on, Vurghun's brother Gara wrote in his memoirs that Vurghun had once said: "In those times I was obliged to criticize Ahmad Javad's Goygol, but that poem is a real work of art." Suleyman Rustam also used to criticize my father, writing articles attacking him: "Let Ahmad Javad tell us by which winds he sends his poems to Turkey to be published." In those times, you dared not talk about other countries, especially Turkey. The KGB would find out and use it as evidence against you. My father's poems were published in Turkey. Actually, I think that's the primary reason why he was arrested in 1937. You weren't allowed to have ties with anybody or any country outside of the Soviet Union. But all of these informers have since passed on. In my opinion, their children who are still living today cannot be held responsible for the crimes of their fathers. The repressions - the arrests, executions, imprisonments and exiles - not only had a devastating impact upon the immediate families, but they had a profound effect upon Azerbaijan as a nation. Wiping out the activists, the brightest thinkers and the most perceptive minds of the nation is the equivalent of destroying the entire nation. My father was rather young when he died - only 45 years old. But he had led a very active life. He had translated Shakespeare's Othello, as well as Romeo and Juliet. A letter that he sent to the Azerbaijani poet Mikayil Mushvig, who also was killed in Stalin's purges, reads: "I have already switched to doing translations, but they still keep criticizing me." So, he had tried to thwart off their attacks by concentrating on translating the classics rather than expressing his own opinions, but still it didn't save him. He also translated some of the works of Pushkin, Lermontov, Gorki and Tolstoy from Russian into Azeri. My father simply could not accept the fact that we had to live under someone else's governance. He wanted independence for our country. He supported the idea of integrity of all Turkic people (Turan). Prior to the Bolshevik takeover in Baku , my father had been the secretary of a charity organization founded by Baku millionaires to assist Turks who were suffering the consequences of World War I. Their main office was in Batumi [Georgia] but they also had a second office in Trabzon [Turkey]. My father directed the Batumi office devoting all his energy to this charity organization. They would go to various villages and towns, assisting the poor with money, food, clothing and necessities. Basically, they were philanthropists. The writer Ali Sabri, headed the Trabzon office, and later was repressed, just like my father. My mother's name was Shukruyya. She was the daughter of the Ajarian Duke, Suleyman Bejan oghlu. 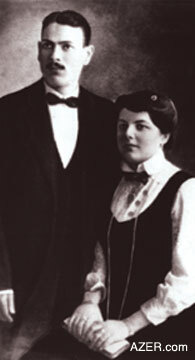 My father and my mother were married in 1916. Actually my mother's parents were against their marriage, so my mother ran off with my father. In 1937 when many people were being arrested and shot, the wives who had three or more children were offered the chance to divorce their husbands and not be sent into exile. The officials made this offer to my mother Shukruyya as well, but she refused. For her, the only thing worse than divorcing Ahmad Javad would be to learn that he had been shot. Since she had gone against her parents' will in marrying him, she vowed never to divorce him. And thus, because of her firm position, they sent her into exile for 8.5 years despite the fact that they had killed him almost immediately. She was assigned to a camp in Kazakhstan, by the name of Aljir. In 1937 when my father was arrested, they also arrested my three brothers: Niyazi (1918- ), Aydin (1921-) and Tukay (1923- ), too, and accused them of being children of an "Enemy of the People". Niyazi and Aydin stayed here in Baku. Tukay, who was only 13 at the time, was sent to the Juvenile Colony for delinquent children in Stalingrad. Myself - I was sent to an orphanage associated with the NKVD headquarters. I was the youngest prisoner there. I was only one year old. I stayed there at the orphanage for a while but then I became very ill. My grandmother (my father's mother) and my older brother came and begged to take me home because no one was actually paying much attention to me at the orphanage. So that's how I ended up living with my grandmother. After her death, I moved in with some of our other relatives. World War II broke out and my brothers volunteered for the front. My older brother Niyazi, after being released from prison, was accepted at the Economics Institute in Leningrad. But when the war started, he, too, joined the army. He had been interrogated and tortured by the secret police five times. Somehow he survived all that and returned to the university, where they attacked him for not disclosing that he was an "Enemy of the People" when he was applying to become a member of the Communist Party. After writing to the authorities, my brother eventually did gain Party membership. I wss so young back then that I didn't really understand much about the difficulties that our family was facing. I could sense that some of our relatives were trying to avoid us because of the stigma of being associated with our family, but there were also others who took care of us and provided physical and moral support. In 1955, upon finishing secondary school, I wanted to apply to the Law Faculty at Azerbaijan State University, but I couldn't get accepted because my parents had been accused of being "Enemies of the People". This was before their names had been cleared and they had been "rehabilitated". So I applied to the Azerbaijan Oil Institute. In 1956 when my parents were rehabilitated, I transferred to the Law Faculty at Azerbaijan State University. From childhood, I had always wanted to be a lawyer. Of course, my father had already been dead 18 years when they cleared him of any criminal behavior and "rehabilitated" his name. Left: Shukriyya, daughter of an Ajarian Duke, who ran off together with Azerbaijani poet Ahmad Javad in 1916 because her parents objected to the marriage. They had five children and so she was given the chance to divorce Javad and dissociate herself with him. When she refused, she was sentenced eight years in exile. Her three oldest children were also arrested and the youngest, Yilmaz, age one, was sent to an orphanage. Ahmad Javad was shot in 1937. When mother finally returned from exile 8.5 years later, she didn't want to talk about her experiences there. It's understandable. She wanted to forget those days. Keep in mind that my mother was a very proud, strong woman. Even while she was in exile so far away from home, she had a strong influence over her three sons who were fighting in the war. She would send them letters and tell them what to do and how to cope with difficulties. She used to tell them that they should work hard, be honest, and prove that their father was not an "Enemy of the People". Mother worked in a labor camp - sewing clothes for the soldiers. They used to work 16 hours a day because they knew that their efforts strengthened the soldiers at the war front. For her, that meant everything because she had three sons at war. During those 8.5 years when she was imprisoned in Kazakhstan, we were never allowed to go and visit her. We used to write her letters, which today are kept in my mother's personal fund in Azerbaijan's National Archives. Actually, these very tragic things affected my life in a very profound way. Obviously, if these things had not happened to my mother and father, my life would have turned out to be very different. I'm convinced that people who have not suffered and dealt with difficulties in their life can never excel in any field - especially in fields that deal with human life and human issues. Those people who have never had to cope with difficult situations in their lives, usually come and go, and don't leave a trace of their existence in the world. From early youth, I had always wanted to become a lawyer. In a way, it makes sense that I would dedicate my life to justice since my mother and father had been at the mercy of such a corrupt legal system. I studied hard and succeeded in becoming a lawyer, and later a judge. I served as a member of the Azerbaijan Supreme Court for 10 years. During that period, I often had to make decisions about whether people who had been convicted of crimes should be given a death sentence or not. Whenever I was faced with such a decision, I used to work on it for hours and hours. I always researched the issues as thoroughly as I could and tried to probe into the reasons why the crime had been committed. Who was really at fault? Who was guilty? Were the parents guilty? Was society guilty? I am proud to say that during those 40 years while working in the legal profession, none of my decisions were ever annulled. From that point of view, the repressions affected my life in a positive way. 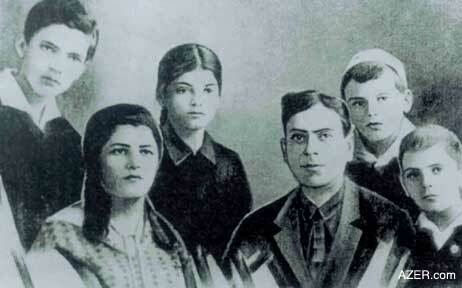 Above: Ahmad Javad's family (left): Niyazi, Wife Shukriyya, daughter Almas, Ahmad Javad, Aydin and Tukay, 1933. The author Yilmas was born in 1936 and was one year old when tragedy befell his family. What is the legacy of Stalin's repressions in Azerbaijan? Every family in Azerbaijan has suffered from the repressions. There's not a single family who escaped untouched by these terrible purges - fathers, mothers, brothers, sisters, uncles, aunts, cousins. Everybody had someone close who had been repressed. Every person who saw and witnessed these things was profoundly affected. Repressions broke some people, utterly destroying them. Others became stronger. It really all depended upon the particular personality and character. Although my father Ahmad Javad was repressed three times, he never gave in. He fought to the end. My mother always told us that no matter where she was sent, she would never disassociate herself from Ahmad Javad's path. Some people fight, some give up, and some become destroyed. All the members of our immediate family were repressed, but none of them became weak. None of them succumbed to committing crimes or acquired bad addictions. They all became heroes. My brothers returned from war and pursued higher education. "In those times, people did bend. They did yield. And in the process, they destroyed themselves from within. A person must have principles, and he must live according to those ideals." What is the meaning of this term: "Enemy of the People"? How can a person be such. And yet this is what the government accused millions of people of being. And it was a very effective way to isolate the family from its vast network of relationships. Other people were often afraid to make any associations with the family when a member was arrested-just at the time when the family needed more, not less, care. One can be a friend of the people. One can love his nation. But no one can be the "Enemy of the People". The term is an artificial creation of Soviet ideology. Who can be the enemy of his nation? No one. This term doesn't have an analog anywhere in the world. Such situation created an atmosphere of extreme tension and fear. In those times, people were even afraid to talk about politics or the government even in their own home, even among members of their own family. Today, there is still evidence of these things in some people's characters. Now we are free and the most valuable asset of independence is that people are able to express their thoughts and feelings freely. In his poem "Mountains" Ahmad Javad wrote: "Don't bend down mountains, Those who bend, won't live, they'll die." In those times, people did bend. They did yield. And in the process, they destroyed themselves from within. A person must have principles, and he must live according to those ideals. One has to be strong and fight for his rights. There will always be problems; one must find a way to cope with them. Our fathers who founded the Azerbaijan Democratic Republic grew up under very difficult conditions but if they had not struggled for our freedom then, this nation would not exist today. If those people had not established the republic, then Azerbaijan would have been divided into many pieces and been absorbed into Armenia, Russia, Georgia and Iran. Azerbaijan would have become a little village. But those people dared to announce to the world that such a State as Azerbaijan exists. They established that entity, printed money, tried to establish an infrastructure - an education system, university, army, and industry. Then they had to turn it over to Russia. Russians accepted our nation as a state and kept our republic in tact until the end. It's true that they gave our nation a lot of grief during those 70 years; but at the same time, they helped us keep our independence during those years. We had our own language, literature, Academy of Sciences, writers. I'm not talking about the ideology of our writers, but at least we did have writers. What do I think about Stalin? To me, he's the "No. 1 Enemy of the People". How can a person with only elementary education govern a country of 300 million people? It's so difficult to solve any problem on a governmental level even when the person is ten times smarter than Marx. How did Stalin manage to hold the people together? He couldn't. That's why he killed so many of them. He had to kill the intelligentsia so he could rule the uneducated. He had only one way - to kill and destroy. And so he ruled by brute force. Half of Azerbaijan was in prison. I'm not even talking about those who were sent to Siberia. Obviously, those who dared to raise their head were arrested or shot. The people weren't able to stop Stalin. Maybe if everyone had united together, they could have done something, but the people who surrounded Stalin were also villains. Even the wives of Molotov and Gaganovich - Stalin's colleagues - were put in prison. What kind of leadership would do that? Only a criminal can do such things. And Mir Jafar Baghirov? To me, he's even worse than Stalin. Baghirov was not able to do anything against Stalin. He either had to destroy himself, or work with Stalin. He had not other choice. In the administrative offices around Baghirov there was no single Azerbaijani - they were all Armenians and Georgians - Grigoryan, Markaryan, Barshov, Yemilianov, Toparidze. These were the people who were determining the fates of Azerbaijani people. They had a quota on how many people to send into exile and to kill. They had to fulfill that plan. If fewer had been killed in Azerbaijan, then an order would have come from Moscow saying, "You are not denouncing a sufficient number of the "Enemies of the People". These days some people defend Baghirov and say that despite the tens of thousands who were killed, he saved the Azerbaijani nation from being exiled to Siberia. But I don't believe that. There is no proof. Let those people provide the evidence - the proof - that Baghirov actually did save our nation. Show me those documents. Show me Baghirov's signature. Stalin was such a determined person that, no one under any condition could make him change his mind or go back on his word if he had already determined to do something. It would have been impossible. So I am not convinced that Azerbaijanis were saved from being sent en masse to Central Asia by Baghirov. No, basically, he conscientiously carried out the will of Stalin. That's all.